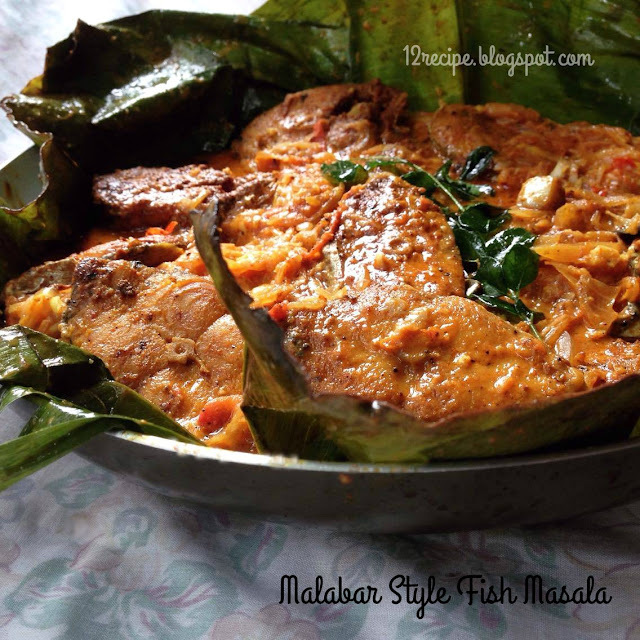 A tradional Northern Kerlala (Malabar) fish gravy cooked in banana leaf. Cooking in Banana leaf makes the curry more flavorful and delicious. It tastes awesome and goes well with rice and other Roti's. Coconut oil gives a nice flavor to all fish recipes than using any other oil. Marinate the fish pieces with ingredients under marinating for 30 minutes. Shallow fry it for few minutes until both sides are just golden in color. Don’t over fry; then it becomes hard. In the remaining coconut oil ; splutter cumin seeds and fenugreek seeds. Add onions and sauté until transparent. Add ginger, garlic and grteen chillies. Sauté until raw smell goes off. Add all the powders (turmeric, chilly, fish masala and salt ) one by one after mixing each addition. Add tomato pieces ; sauté until mashed well. Add curry leaves and thick coconut milk. When it starts boiling switch off the flame. Cook for about 10 minutes or until thickens; switch off the flame. Let the curry rest for about 30 minutes. Serve warm by heating it again for a minute.